Malcolm X once said, "You can't have capitalism without racism." In the case of the downtown Burlington mural "Everyone Loves a Parade!," that statement appears to hold true. Commissioned by the Church Street Marketplace and funded in part by local businesses, the mural was painted by Québécois artist Pierre Hardy and his Vermont assistant Mary Angelina, and unveiled in 2012 in Leahy Way, an alley off Church Street. It was intended to commemorate Samuel de Champlain's "discovery" of Lake Champlain and some of the people who shaped Vermont's history over the subsequent 400 years. Five years after the mural's installation, activist Albert Petrarca cried foul, spray-painting its legend with the phrase "Off the Wall." The action mobilized other locals to express their view that the mural, which depicts primarily white subjects, is racist. In response to the controversy, the city council formed a task force that has been meeting regularly since May. 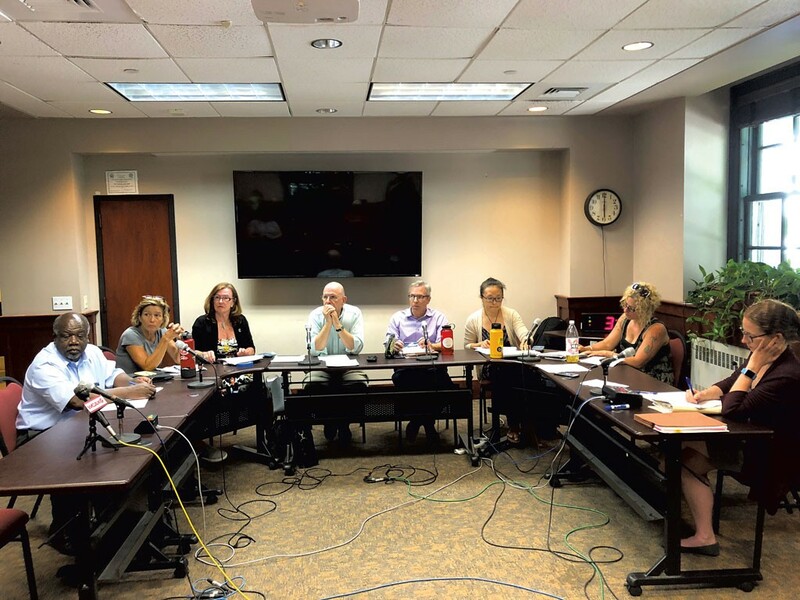 Last week, after reviewing testimony from the mural's creators, business owners, Marketplace executive director Ron Redmond and others, the task force delivered its recommendations to the city council in advance of its Monday night meeting. The task force made eight suggestions in total, many relating not just to this mural but to future public artworks the city might commission. The first recommendation concerns the city's current effort to update its Art in Public Places program guidelines. Burlington City Arts assistant director Sara Katz said that BCA intends to propose a "percent for the arts" program to city council. The task force also recommended that requests for proposals for public art be made public only after funding is in place. When the Marketplace issued the RFP for "Everyone Loves a Parade!," no funding yet existed for the artist, according to task force chair Weiwei Wang. This meant the artist became, in part, responsible for fundraising for his own artwork. Another recommendation: A diverse group of people should be able to review new public works before they are installed. The task force also suggested that the city commission multiple murals showcasing Vermont's diverse history. As for "Everyone Loves a Parade!," the task force recommended that the mural be removed from the wall and relocated elsewhere in the city by August 29, 2022, and that new placards be put up that explain how the mural was made, what it is, and what it is not. The task force suggested that the city choose a Vermont artist to create new work for the mural's current location. During a public comment period at Monday's city council meeting, locals spoke both for and against removal of the mural. Afterward, members of the task force sat before the city council to answer questions about their recommendations. Councilor Ali Dieng (D-Ward 7) asked why the specific date of August 29, 2022, was chosen. Wang responded that the date would mark 10 years of the mural in Leahy Way, per a verbal agreement between the Marketplace and Hardy. It would also give the city time to come up with funding for a new mural. City council President Kurt Wright (R-Ward 4) wondered whether it would be acceptable simply to move the mural to another location off Church Street. "Is the task force feeling ... that the people who are bothered by it would not be bothered by it as long as it is somewhere else?" he asked. Task force member Jen Berger replied, "Where it is and what it's trying to say has a very strong impact." She referred to testimony from people of color who described having feelings of invisibility and erasure when they looked at the mural. Housed somewhere else, Berger said, with new placards providing context for its creation and subject matter, the work will have a different impact. "What's happening right now is, it appears to be a history, and it's an inaccurate history," she added. Wright also asked if the task force had considered suggesting that a new mural be placed across the alleyway from the current one. "It didn't feel right to leave it up," said Berger, "or that having something across the way would soften or lessen the impact." What's next in this saga? City council members will come up with resolutions for dealing with the mural by late September, estimated Councilor Joan Shannon (D-South District). "We're not kicking the can down the road," said Councilor Jane Knodell (P-Central District).